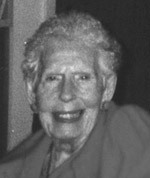 Beth Gray celebrates her ninetieth birthday on April 11, 2008. Send greetings to her c/- San Carlos Elms, 707 Elm Street, San Carlos CA 94070 USA. Beth has given us all in the Usui Rei-ki Network around the world, an irreplaceable heritage in the preservation of the authentic teaching of the practice and metaphysical insights of rei-ki. She is a living testimony to the vitality and longevity which is its gift. Graduates in the Advanced Level of rei-ki 2 are requested to give thanks by including Beth in their distant healing list of priorities.